Forged in the fires of the Bronx and Kingston, Jamaica, hip-hop became the Esperanto of youth rebellion and a generation-defining movement. In a post-civil rights era defined by deindustrialization and globalization, hip-hop crystallized a multiracial, polycultural generation's worldview, and transformed American politics and culture. But that epic story has never been told with this kind of breadth, insight, and style. 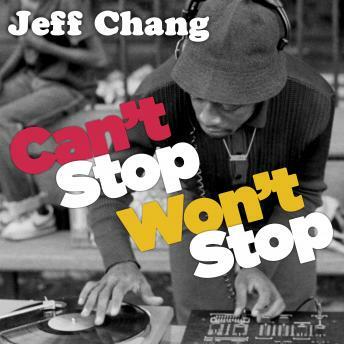 Based on original interviews with DJs, b-boys, rappers, graffiti writers, activists, and gang members, with unforgettable portraits of many of hip-hop's forebears, founders, and mavericks, including DJ Kool Herc, Afrika Bambaataa, Chuck D, and Ice Cube, Can't Stop Won't Stop chronicles the events, the ideas, the music, and the art that marked the hip-hop generation's rise from the ashes of the '60s into the new millennium. Here is a powerful cultural and social history of the end of the American century, and a provocative look into the new world that the hip-hop generation created.